November 21, 2018 by Benjamin G.
Laemmle Theatres and the Anniversary Classics Series present a 55th anniversary screening of acclaimed director Luchino Visconti’s sumptuous masterpiece, THE LEOPARD (Il Gattopardo). 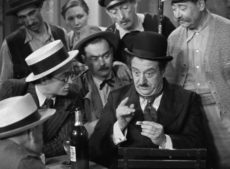 The film will close out the year for the popular Anniversary Classics Abroad program of showcasing vintage foreign-language cinema. The Leopard is based on the historical novel by Giuseppe Tomasi de Lampedusa, an international best seller upon publication in 1958. The story is set in the 1860s during the turbulent period of the “Risorgimento,” the struggle for the unification of Italy. All this is reflected in the fate of one Sicilian aristocratic family, headed by Prince Fabrizio de Salina (Burt Lancaster). The Prince (the Leopard) at first resists all the political and social changes, but comes to accept them after their embrace by his pragmatic nephew (Alain Delon), who joins Garibaldi’s Red Shirts and marries the daughter (Claudia Cardinale) of an ambitious small-town merchant mayor to secure the family’s place in the new Italy. Visconti was drawn to the material about fading aristocracy from his own heritage, as he was born to nobility in Milan. He had previously explored his country’s past with another historical adaptation, Senso, in 1954, and that film is also considered a masterwork. 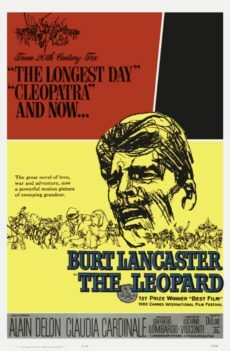 The Leopard won the Palme D’or at the 1963 Cannes Film Festival and has been reissued on several occasions. The film is notable for its rich production design by Mario Garbuglia, cinematography by Giuseppe Rotunno, and Oscar-nominated costume design by Piero Tosi, who won an Honorary Oscar in 2014. Martin Scorsese is one of the film’s champions, placing it on his own personal list of the 12 greatest films ever made, extolling “the deeply measured tone…its use of vast spaces, and also the richness of every detail.” As a lament for a lost world, the film is considered Italy’s Gone With the Wind. Also starring Terrence Hill (Mario Girotti), Paola Stoppa et al. Music by Nino Rota (La Strada, Romeo and Juliet, The Godfather). Visconti co-wrote the screenplay with Suso Cecchi d’Amico, Pasquale Festa Campanile, Enrico Medioli, and Massimo Franciosca. The Leopard screens on December 5 at 7:00 PM at the Royal, Town Center, and Pasadena Playhouse. Joanna Lancaster, daughter of Burt Lancaster, will participate in a pre-screening Q&A moderated by film critic Stephen Farber at the Laemmle Royal in West LA. Hey Laemmle, which version of the film is this? Original Italian or English dubbed? It’s in Italian. Updated the post. Thank you!